If you have not bought a new powerboat in the last few years you may have missed a quiet revolution in design that has taken place. Subtle changes in hull design have produced performance benefits which were not possible previously. The newer boats plane a little more efficiently but the biggest change is in the cornering. Flat turns are very prominent in the new generation of vessels afloat. Patrick J. Bray. 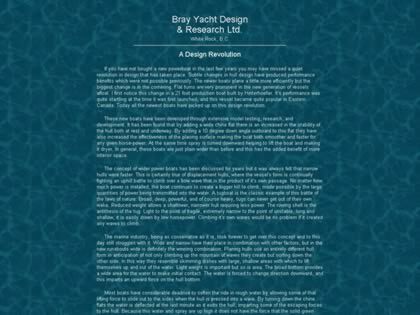 Web Site Snapshot: If available, above is a snapshot of the A Design Revolution web site at http://www.brayyachtdesign.bc.ca/article_revolution.html as it appeared when this site was added to the directory or last verified. Please Note that Boat Design Net has no involvement with the above web site; all content and images depicted in the above thumbnail are the property and copyright of A Design Revolution unless otherwise noted on that site. Description: If you have not bought a new powerboat in the last few years you may have missed a quiet revolution in design that has taken place. Subtle changes in hull design have produced performance benefits which were not possible previously. The newer boats plane a little more efficiently but the biggest change is in the cornering. Flat turns are very prominent in the new generation of vessels afloat. Patrick J. Bray.